IsraAid, an Israel NGO dedicated to saving lives in disastrous situations, provides teams of professional medics, search and rescue workers and community builders who are often the first responders in times of crisis. Haiti, Japan, Sierra Leone, Sudan, Kenya and Uganda are only a few of the nations to which IsraAid has responded. In fact, since the organization was founded in 2001, it has rushed to the aid 39 countries. The tiny country of Israel, relative to the size of New Jersey, has sent more aid teams in than any other nation. Even the United Nations, an organization founded to govern and guide, has far less success. IsraAid professionals do not see the color of a victim’s skin or care about the religion they practice. IsraAid team members are Israeli Jews, Christians and Muslims. Nothing matters more to them than the people whose lives they are saving. They work as a team, a lesson so many of us still have to learn. This is why IsraAid can boast that it has reached more than a million people worldwide and how it has have been able to drop tons and tons of relief and medical supplies to those in need. IsraAid has dedicated professionals that help train others on and off site. They are capable of mobilizing a vast number of volunteers if the need is there. Often it is not just doctors and nurses but psychologists, social workers and physical therapists who are needed in a dire situation. Maybe it is the IDF training that teaches skills, maybe it is hours being on call in a hospital and maybe it is just tikkun olam that gives them the drive. Whatever it is, IsraAid should be recognized as a leader in this much needed realm. Proudly, this is an Israeli non-profit, non-governmental group of humanitarians, another accomplishment for our oasis in the desert. South Sudan is an area where decades of conflict have led to extensive poverty and ruin. South Sudan is where young women are genitally mutilated and raped, where gays are tormented. IsraAid not only provides much needed medical care but trains people on how to counsel those in need. IsraAid did not just drop off food and bandages and take off but has set up a two-year plan on how to improve living conditions for the people. In 2011 Japan was hit with a powerful earthquake and tsunami that destroyed millions of acres and thousands of people’s lives. Within days the Israeli team was there to help clean debris, build schools and care for children. People wandered the flooded streets searching for relatives for weeks on end, but IsraAid workers cared for their children. Children who suffered the loss of home and family members were given warm clothes and engulfing hugs. This was given to a country that so rarely defends Israel. In 2013 a typhoon hit the shores of the Philippines. Even before the storm ended, a team from Israel had arrived. This was not the first trip IsraAid had made to this island country as it was there in 2009 as well. The organization continues to work with the local government by providing medical as well as building reconstruction expert advice. 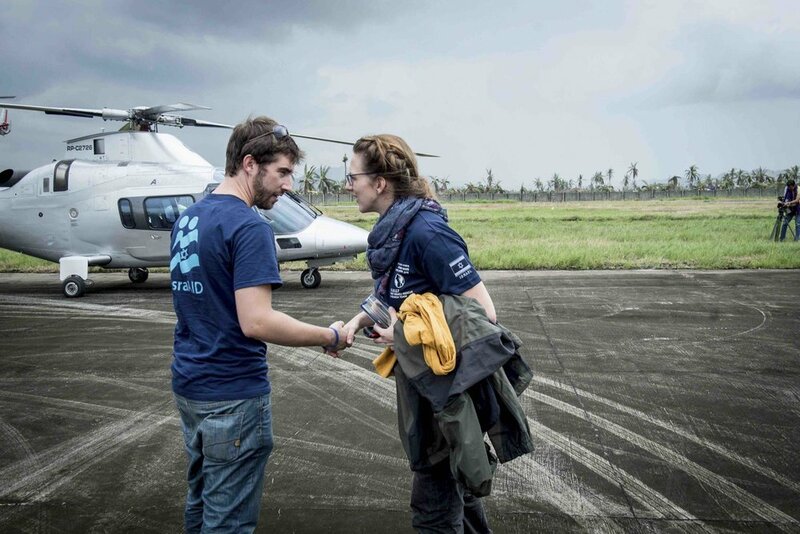 IsraAID emergency responders in the Philippines after Typhoon Haiyan. Earthquakes struck Nepal in 2015. As in Haiti, homes are not built to last through earthquakes even smaller on the Richter Scale. Devastation was everywhere. The need for housing, fresh water and psycho-social services is all consuming. IsraAid is not just building temporary housing but teaching citizens how to build these shelters, how to use solar power and plant sustainable gardens. It is one thing to give aid when a crisis arrives but even more important to teach others how to improve their lives and even prepare for the next disaster. Uganda is a place where the illiteracy rate is over 70% and the infant mortality at 45%. It is a country where nearly 90% live in rural areas and all too many children become foot soldiers in an unending civil war. IsraAid has decided to set up programs so that children have something else to do, somewhere else to go. There are counselors to talk to and programs to join. IsraAid has also started a water management program, which is something our desert land has been doing for decades. Maybe one day Uganda will also be blooming with bright flowers and smiling faces. When Hurricane Sandy reached the east coast causing ruin, IsraAid teams flew over. In 2013 when tornadoes swept Oklahoma, an IsraAid team went to help out. Whether it was Hurricane Katrina, floods in Colorado or another disaster, nothing kept IsraAid from coming to help. The USA may send Israel drones and dollars, but Israel returns the favor by sending in troops of helpers distributing Israeli made medicine, bandages and expert advice. Greece, where thousands upon thousands of Syrians, Iraqis and Afghanis are seeking asylum, is another example. Over 6 million Syrians have been displaced. Around the same number of Jews died during the Holocaust, so we can only imagine the numbers trying to escape to freedom. The “Global Asylum Seeker Crisis Response” program is a massive effort. The IsraAid “Island of Tears” video shows rescue teams on hand as boatloads of Syrian refugees reached the shores of Lesbos Island. Imagine their surprise when they are greeted by Israelis who can speak to them in Arabic making them feel immediately more come welcome. Many are shocked to meet a Jew, let alone one helping them. Soon their common goal to help each other erases any fear. “Island of Tears” was a tear jerker. Reading about all the work IsraAid does is remarkable. However, it still makes me wonder why Israel is perceived so negatively when an NGO like IsraAid is so successful and engaging. Israelis risk their lives to find bodies in immense snow drifts and flooded waters of New Orleans. Israelis go into Ebola affected Sierra Leone to treat patients whereas others would fear for their lives. Israelis live amongst people who know little about hygiene, live in mud huts and drink poisonous waters. It is difficult to even imagine Israelis without a cell phone in hand, let alone living without electricity. IsraAid staffers are certainly mensches. IsraAid staffers wear their shirts with pride. They represent Israel in such a positive light. If only those they rush to aid helped them by not condemning Israel. Imagine if countries like Japan actually stood up in a United Nations meeting and yelled out, “Enough sanctions on Israel; what about what Syria”?” Imagine if Greece spoke up in a European Union meeting about the horrors people have seen on their shores from boatloads of battle torn innocents? Then there is Germany, dear Germany who opened the gates to so many and now wishes it could turn many away. The Germans call in IsraAid and Israeli intelligence to spot who may be a threat to their way of life. Who will be the next to plow down holiday shoppers? Who will be the next suicide bomber? Germany is proof that we must know who we are letting in. Thankfully, we have IsraAid and Israeli know how to make the world a little better. It is taking tikkun olam to the next level. Thanks to all those who do their part. May shalom be granted in 2017.